We're still reading through the The Read-To-Me Storybook at lunchtime. I've been doing a few stories at a time because it's starting to get tedious for me, and I'm eager to move onto something else. Miss Muffet mostly enjoys the stories and poems; Bo Peep tunes in and out depending on her mood and whether she finishes her lunch while we're still reading. 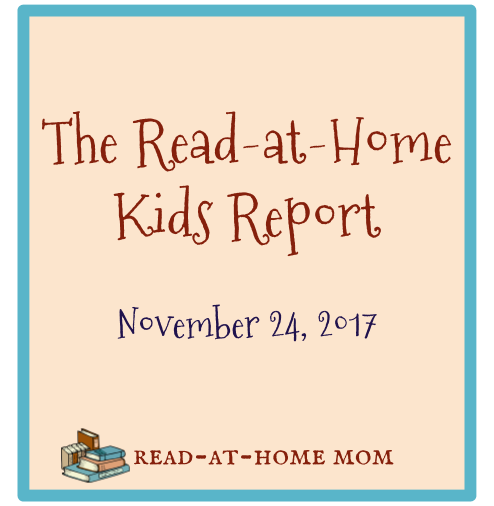 Yesterday, we did a lot of reading at both the lunch table (to keep them busy while Daddy cooked) and the dinner table (to keep them contained between dinner and their Skype date with their grandmother). In addition to Thanksgiving poems from The Year Around by Alice I. Hazeltine and Elva S. Smith and Callooh! Callay! by Myra Cohn Livingston (our go-to collections for holiday poetry), we also read The Thanksgiving Story by Alice Dalgliesh, Little Indian by Peggy Parish, and All for Pie, Pie for All by David Martin. My Goodreads review of The Thanksgiving Story was surprisingly negative when I went back and read it. I will need to make an update because I thought it was actually quite good and more than age appropriate for Miss Muffet. I had this when I was a kid and bought a copy for her over the summer knowing it would be good for a beginning reader. She loved it so much, she asked to read us a few selections after dinner, including the poem about the dad who carves the turkey and cuts his thumb. I bought this randomly at a book sale after recognizing the name of the illustrator, Cindy Szekeres. I haven't read it yet, but Miss Muffet read it cover to cover in just a couple of days, and she seemed to really love it. I do like the pictures, and I plan to read it myself when I have a chance. We realized that, despite Miss Muffet's strong interest in science, we haven't been reading a whole lot of science with her. We have a box full of Let's Read and Find Out About Science books, so I've decided to start leaving them for her to read after her nap. I know she won't understand everything on her own, so my plan is to re-read each book with her as well. So far, she has read this one and part of How You Talk by Paul Showers, but we haven't had a chance to read either together yet, so that will probably happen this weekend. Sounds of Laughter by Bill Martin, Jr. This is an old elementary school reader that I found at the library's used bookstore and bought mostly for my own amusement. But it has a lot of stories in it that Miss Muffet can read, so I gave it to her one afternoon and she has asked for it every day since. This week, Bo Peep has been in a musical mood. She keeps asking me for "story books," by which she actually means singable books. By far, her favorite of the week was Over the River and Through the Wood, illustrated by Christopher Manson. We have sung it over and over again, sometimes accompanied by me on the ukulele, and at the conclusion of each time through, she immediately wants to hear it again. When she's not belting out "Hurrah for the pumpkin pie," however, she does allow me to sing and play from other books, including Songs to Grow On and More Songs to Grow On by Beatrice Landeck and Go In and Out the Window published by the Metropolitan Museum of Art. I don't think I read anything specifically to the baby this week. She did have some time with Tana Hoban's Black and White, and she was around for a lot of the sing-alongs I had with Bo Peep, but I didn't sit down to read with just her. But I do have a mental list of picture books I want her to hear, so it's just a matter of finding a time when she's awake and calm and the other two girls are not around to interrupt.